William Robert Schulz and Dr. Jane Bolton Schulz received honorary degrees as Honorary Doctor of Humane Letters during the Fall 2012 Commencement Ceremony at Western Carolina University, Cullowhee, NC, on Saturday, December 15, 2012. Billy’s Doctorate was awarded posthumously. Dr. Jane Bolton Schulz and the late Mr. William Robert “Billy” Schulz blazed a trail for what could be – and what should be – the educational, vocational, and social opportunities afforded to people who have Down syndrome and special needs. Dr. Schulz, you were a wife and mother of three with a fourth on the way when a doctor diagnosed your son Billy, who was born in 1956, with Down syndrome. He advised you to take Billy home and love him. Love him you did, so deeply and so fiercely that you became a champion for him and for the quality of life he could have. Together you became pioneers in special education and champions for all who have intellectual disabilities. Your journey involved risk. Refusing to accept that Billy could not start school until age eight, you secured a job at a school that allowed you, without a college degree, to teach kindergarten and to bring Billy with you. Billy thrived, and you were inspired to expand those integrated classroom experiences in a landmark textbook you co-authored, Mainstreaming Exceptional Students: A Guide for Classroom Teachers. As Billy became a man, you both found vocations. After discovering your exceptional gift for teaching, you enrolled at Auburn University and earned bachelor’s, master’s, and doctoral degrees. Inspired by your son, you became a powerful force in the field of special education. You helped to bridge the gap between the theoretical and the “real world” by drawing upon what you learned in your own life and from Billy’s. As a faculty member at Western Carolina University for more than 20 years, you shared your experiences, ideas, and insights with thousands of students. Along the way, Billy continued to show you that he and others with Down syndrome were capable of far more than many realized. He became a beloved staff member at WCU’s Hunter Library for 21 years. He also worked at a nursing home where he helped care for his father, and at a grocery store that earlier this year awarded him a pin for ten years of service. As you delivered hundreds of presentations and workshops on improving special education, Billy overcame stage fright to join you at some of those talks. In his own words, he helped you share the story of his life and dispel negative stereotypes of people who have disabilities, and encouraged all to seek their full promise. Together, you motivated and inspired countless others. You also developed a statewide program to train teachers to better work with special-needs students. Your ground-breaking work challenged educators in traditional classroom settings to embrace a bold new perspective when teaching children with disabilities and to see the potential that exists beyond a disability. You were instrumental in organizing the Special Olympics program in Jackson County, an effort that spilled over to surrounding counties across Western North Carolina, culminating in a large district meet held on the WCU campus. Your love for your own child and your dogged determination to help build a better life for Billy have made it possible for many other special-needs children to reach far beyond what once was expected. Dr. Schulz, you and Billy have indeed brought about change by being that change. The rights and educational, vocational, and social opportunities for people with Down syndrome have only just begun to catch up with what you, Billy and your family envisioned. In Billy’s role as son and brother, boy and man, and your role as mother and educator, you both blazed through uncharted territory and helped others realize what was possible and what should be normal for persons who have Down syndrome and intellectual disabilities. The field of education is far better today because of the contributions you both have made. 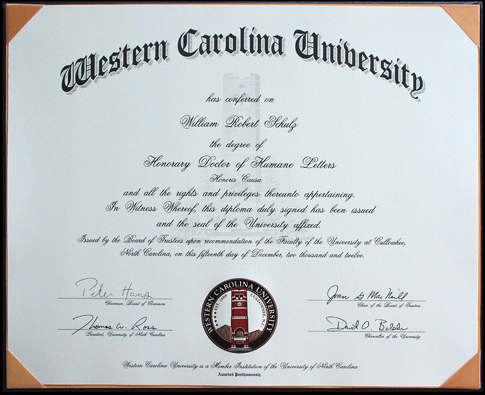 In recognition of these many accomplishments, in appreciation for enriching our communities, and in gratitude for raising the bar of our humanity, the Board of Trustees of Western Carolina University is pleased to award, and the Chancellor to confer, the degree of Doctor of Humane Letters, honoris causa, upon Jane Bolton Schulz and posthumously upon William Robert “Billy” Schulz at this commencement ceremony, December 15, 2012, with all the rights and privileges thereto appertaining. 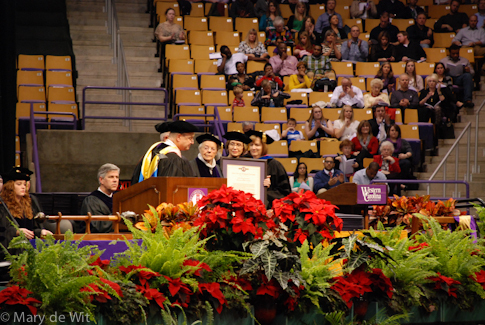 Chancellor David O. Belcher awards the Honorary Doctor of Humane Letters to Dr. Jane B. Schulz and to William R. Schulz (posthumously) at the Fall 2012 Commencement at Western Carolina University. I never dreamed of receiving such an honor, and wish Billy could be here. He really deserved this more than I do. I developed Bell’s palsy soon after Billy died, so please bear with me if my speech is difficult to understand. My family and I came to Cullowhee in 1971, looking for a fresh start. Like others here today, I found the career of my life at Western, in an environment that was stimulating and rewarding. Billy was the motivation for my career, and he was the one who made our presentations remarkable. Here was this man, whose IQ measured below 60, relaying a message that inspired others. and that you go to church on Sunday because people are counting on you. Each of us can accomplish surprising things. to make in our community. Billy made friends with everyone. “Hi, I’m Billy; you got a dog?” made it difficult for anyone to ignore him. We have heard from people we don’t even know who, frequently, would go in the store where Billy worked and be uplifted by his greeting and cheerfulness. We all miss him. Last August, Chancellor Belcher called to tell us about the honor Western Carolina University intended to bestow upon us. During that time, Billy was sick with the beginning of the illness that led to his death. I sat on his bed and explained the honor to him. And so, speaking for my amazing family, our devoted friends, for myself, and especially for Dr. Billy, thank you. In addition to National Down Syndrome Awareness Month, October is also National Disability Employment Awareness Month. How appropriate that they occur in the same month! In the last few years, we have seen many adults with Down syndrome in the workplace. Billy is one of them; he has worked at Food City in Kingsport for over 10 years. 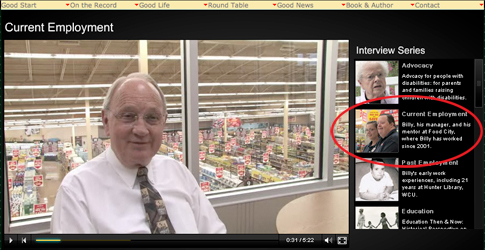 He was originally hired by Ed Moore, who has been a manager at the grocery chain for over fifty years. His philosophy is one that might be adopted by all employers. Click on the image to see the Grown Man Now Interview Series; “Current Employment” is the name of this interview with Mr. Moore. We also see adults with other disabilities in a number of work situations. Employers have found that many people formerly considered unemployable can be valuable members of the work force if they are trained properly and given the opportunity. Our president emphasizes their value to our nation in declaring October National Disability Employment Awareness Month. Are you aware of the many adults with disabilities at work in your community?